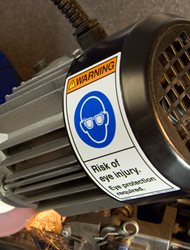 Clarion Safety Systems helps companies reduce risk and protect people with best practice, standards-compliant safety labels, safety signs, and safety markings. We look forward to explaining how risk assessment and hazard identification can help to reduce accidents and prevent liability exposure – and giving examples of how we’re breaking new ground in this field. Clarion Safety Systems, a leading designer and manufacturer of safety signs and labels, announced today that its CEO Geoffrey Peckham will present an educational lecture on product liability at the 26th Annual Product Liability Conference. The 3-day course takes place September 23-25, 2014 at the University of Wisconsin-Madison, a leader in product safety and liability prevention programming. The conference, which will be held at the university’s Pyle Center, is aimed towards engineers, product safety personnel, paralegals, attorneys and others with product safety-related responsibilities. As one of the experts selected to lecture, Peckham, who serves as chair of both the ANSI Z535 Committee for Safety Signs and Colors and the U.S. Technical Advisory Group to ISO Technical Committee 145 – Graphical Symbols, will present practical information to assist companies with improving their products’ warnings and instructions. The lecture, taking place during the September 24 session, will be presented together with Michael T. McGettigan, product safety manager at Dematic Corporation, a global leader providing a range of intelligent logistics and materials handling solutions. Peckham’s background includes more than two decades of experience in actively advancing safety communications. He has led and continues to lead both the U.S. and international efforts to harmonize standards in the area of safety signs, labels and markings; this includes contributing to the leadership and direction of ANSI, ISO, OSHA and NFPA safety codes. Additional information on the full course outline, earning continuing education credits and enrollment can be found on the University of Wisconsin's website. In achievement and prestige, the University of Wisconsin–Madison has long been recognized as one of America's great universities. A public, land-grant institution, UW–Madison offers a complete spectrum of liberal arts studies, professional programs and student activities. Each year, the Department of Engineering Professional Development (EPD) conducts hundreds of continuing education courses for engineers, scientists, architects, managers and other professionals. More than 10,000 students representing more than 5,000 businesses attend at our Madison conference center or at major hotels/conference centers around the country. Our courses provide a mix of classroom lectures, hands-on sessions, problem-solving experiences, and group discussions, giving you opportunities to fully examine and apply the ideas and concepts presented.